These perfect pavlova-style meringues are crisp on the outside, yet soft and almost marshmallow like on the inside. Here they are filled with passion fruit cream and topped with a selection of prepared fruits for a delicious exotic flavour. Preheat the oven to 140°C, gas mark Lightly grease a baking tray and line with non-stick parchment paper. Place the egg whites in a large clean bowl and whisk with an electric whisk (or a metal balloon whisk) until they form soft peaks. Gradually whisk in the caster sugar, a tablespoon at a time, until the mixture turns thick and glossy. Then carefully fold in the white wine vinegar and cornflour using a large metal spoon. Spoon the mixture onto the baking parchment to make 4 nests measuring about 10cm in diameter. Place in the centre of the oven for about 10 minutes then lower the oven to 120°C, gas mark 1/2. Bake for 50 minutes, then turn the oven off without opening the door. Leave inside the oven for about 4 hours or overnight until set. When ready to serve, peel away the paper and place on serving plates. Cut the passion fruit in half and scoop out the seeds and juice straight into the cream and stir through carefully. 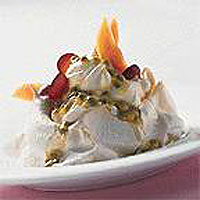 Spoon into the meringue nests and scatter the remaining prepared fruits on top.